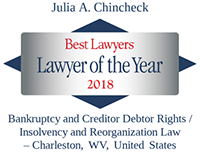 Julie Chincheck concentrates her practice on creditors’ rights and bankruptcy law, financial services litigation and commercial and banking law. Julie possesses a deep understanding of bankruptcy principles and law. She has been the responsible attorney for litigation matters and transactions relating to all types of bankruptcy and insolvency issues, both from a commercial and a consumer perspective. 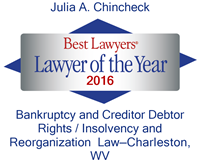 She served as co-counsel on West Virginia’s first Chapter 9 municipality bankruptcy. While she has most recently focused her practice on creditor and trustee representation, throughout her career she has represented creditors, debtors, trustees and official committees in a broad range of bankruptcy, reorganization and workout matters, including related litigation and business transactions, and buyers in connection with sales arising out of bankruptcy cases. Outside of the courtroom, Julie regularly advises clients regarding pre-bankruptcy matters, as well as the benefits and burdens of a bankruptcy filing, whether the client is considering a bankruptcy filing or evaluating defensive positions in the event of a filing. In addition to bankruptcy, Julie’s litigation practice is focused on creditors’ rights and commercial disputes, in which she represents banks and financial institutions, corporate entities, business owners and individuals. Recent cases involve claims of tortious interference, lender liability, bank officer wrongdoing, West Virginia Consumer Credit and Protection Act violations, judgment enforcement, mechanics’ lien perfection and enforcement, and lien priority disputes and enforcement. Julie routinely handles commercial loan transactions and out-of-court workouts for banking and business clients. Julie's experience includes asset-based facilities, working capital facilities, floor plan financing, participating agreements and other finance projects. Clients also rely on her to review and negotiate their commercial contracts, including banking clients’ contracts with numerous national service providers. Julie is a frequent lecturer on bankruptcy law, creditors’ rights and the Uniform Commercial Code, and she has authored numerous publications on bankruptcy and commercial law issues. Successful representation of a major Virginia bank seeking payment for losses stemming from loans backed by forged collateral under a financial institution bond issued by a major insurance company. Successful representation of a former bank director and officer in litigation brought by the Federal Deposit Insurance Corporation. Successful representation of banks in lender liability cases in state and federal courts. Successful representation of a West Virginia bank in RICO and fraud litigation in state court. Successful representation of West Virginia banks in cases alleging violations of the West Virginia Consumer Credit and Protection Act. "Bankruptcy Court Holds Truncated Name of Secured Party on Certificate of Title Still Perfected Lien"
"West Virginia Modifies As-Extracted Collateral Filing Requirements"